The Kids and Kubs: Play Ball! 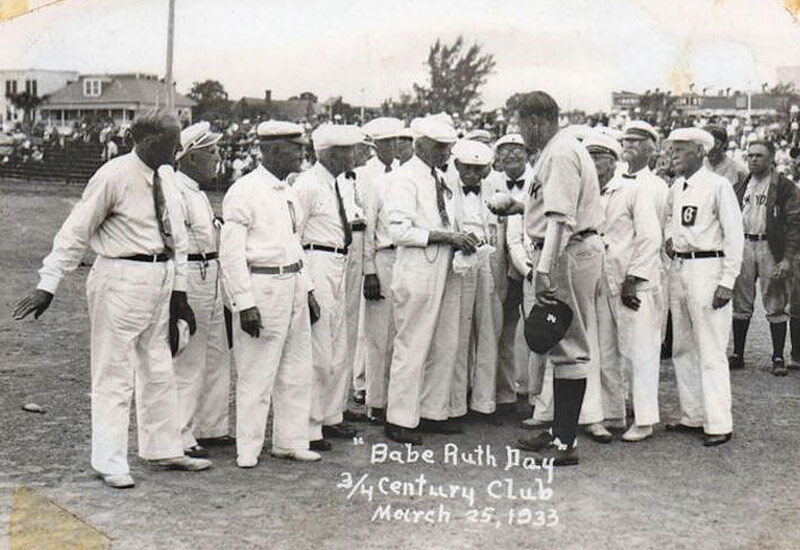 The Kids and Kubs slow pitch senior softball club’s first game was May 30, 1931. The club is the oldest continuous soft ball club in the United States. In the early years the club played most of their games at Waterfront Park, generally where Al Lang Stadium is now located. Today they play at Northshore Park, at a dedicated field next to the Northshore swimming pool. The club has played exhibition games against local teams around the area and especially ‘ladies’ teams for more than 50 years. According to the club’s official history, the club has played before an estimated half-million fans since 1930. In the 1939-1940 season alone, an estimated 50,000 people watched the games. One game drew 8,500 fans. 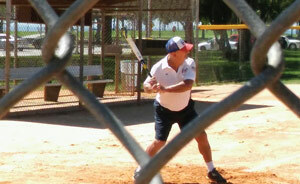 Exhibition games were played in the early years throughout Florida and even in Cuba. In the 1980s, games were played in California, Kentucky, Ohio, and Pennsylvania. In the 1930s, ’40s and ’50s, the club enjoyed the on-field participation of baseball legends Babe Ruth, Lou Gehrig, Bob Feller, Hank Greenberg, Lefty Gomez, Pepper Martin, and Connie Mack. Babe Ruth occasionally volunteered as a base umpire. The Kids and Kubs played their first Senior Softball World Series National Softball Tournament in 1992 in Detroit, Michigan. They won the World Championship in 1998 at Chicago, Illinois in the 80-and-older division of play, and two National Titles since then. Seven Kids and Kubs players have been inducted into the National Senior Softball Hall of Fame since 2002: Ray Bosetti, Delphine (Del) Bowyer, Andy Devine, Paul Good, Ethel Lehmann, Larry McCurdy, and Hal Oliver. In 2005, a marble bench monument honoring past and present Kids and Kubs members was erected at North Shore Field. The monument includes capsules of historic documents to be opened in 2030 for the 100th anniversary of the club. Evelyn Barton Rittenhouse was the co-founder of the Kids and Kubs along with Dr. M. H. Emory. Evelyn herself served as a base umpire. 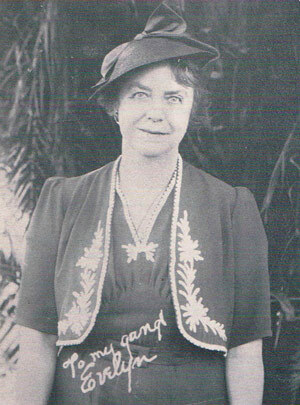 Like so many early residents, she came to St. Petersburg for her health, from New York City in 1918. Evelyn fell in love with the climate and eventually became owner and operator of the Hibiscus Hotel at 106 3rd Street South. She was a whirlwind of civic activity, organizing the Grandmother’s Club, the Three-Quarter Century Club, the Show Biz Club, and the Senior Citizens Club. The latter organization is believed to have been the largest of its kind in the world, having at one time more than 5,000 members. Her most enduring accomplishment was initiating what came to be known as the Kids and Kubs. The Three-Quarter Century Club was a social organization which mostly engaged in sedentary activities. Some members demanded more robust challenges and so the Kids and Kubs was born. In the early years, members would be divided into two teams, one called the Kids, and a second called the Kubs. Before organizing the Kids and Kubs, Evelyn and her friend ‘Doc’ Emory conferred with John Lodwick, Chamber of Commerce publicity director. She noted, “Mr. Lodwick was of course enthusiastic about the publicity slant of the plan, but feared that some of the players might drop dead running the bases, and so expressed himself, suggesting that we think it over seriously before launching the scheme… It was first suggested that players walk to the bases, but later it was decided to run…” (To be precise, it was decided to run in the third inning of the first game.) Over the years, the club members’ famed healthy longevity has been documented in film by the American Medical Association, and Bay Pines Veterans Hospital even examined team members seeking to learn “what makes us tick at our age.” In 1959, one player celebrated his 80th birthday by standing on his head at home plate before the game began. The Club minutes for 1956-57 commented that of the club’s twenty nonagenarians to that date, 13 passed away at the average age of 93.9 having played an average of 7.3 years. The remaining 7 were still living at the time, having played an average of 9.1 years. The league made its mark not only in St. Petersburg, but also nationally and internationally. The club has been chronicled in such national publications as the Saturday Evening Post, Colliers, Reader’s Digest and American Magazine. The Kids and Kubs was one of St. Petersburg’s foremost early tourist attractions along with the Waterfront Parks, Million Dollar Pier, the Green Benches, spring training for major league baseball, Sunken Gardens, Webb’s City (touted as the World’s Most Unusual Drug Store), and of course our paradise climate and location. In December 2007, the Kids and Kubs played in Hawaii, not far from Pearl Harbor, against a team from Japan. The event was held to commemorate the end of World War II, and honor both Americans and Japanese who fought and especially those who died in the Pacific. Two years later, five members of the club who were World War II veterans that served in the Pacific were invited to play in Japan in an extension of the 2007 event in Hawaii. 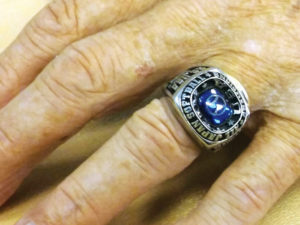 Maynard Saugstad’s “All Japan Softball Championship” ring. 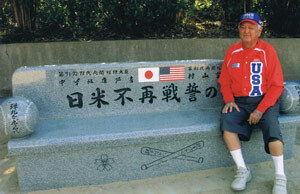 Maynard Saugstad, a former club president and pitcher, was one of those who played in the 2009 games in Japan. He was 82 at the time and played as pitcher. Over the years, Maynard has been to Japan five times to play senior softball. Maynard moved to St. Pete in 1987 from Wisconsin, where he was a high school business teacher and coached JV football and basketball. He joined the Kids and Kubs in 2000 at age 75, but had previously umpired games. His wife Joyce also was a member as a batgirl. The games in Japan were played at Honkawa School in Hiroshima, one of two cities in Japan that was devastated by atomic bombs in 1945. Maynard witnessed the carnage at Hiroshima himself in 1946 as a naval serviceman aboard the USS Duluth. Honkawa School was the closest school to ground zero and an estimated 400 students and ten teachers fell victim to the atomic bombing. On a related note St. Petersburg has had a 55-year Sister City relationship with Takamatsu, Japan, another city devastated by bombing in World War II. Maynard and Joyce had previously hosted many international students as part of a program called Youth for Understanding in Wisconsin. One student was from Japan. In addition to receiving red-carpet treatment from Japanese baseball officials, the trip was an opportunity to reunite with his former Japanese student guest. Maynard particularly remembers the student addressing Joyce as ‘mother,’ reflecting the close relationship developed with the Saugstad family during his year’s stay in the States. Maynard remembers the trip fondly. “Hiroshima has been totally rebuilt and is a now a beautiful, beautiful city.” The trip also had its humorous moments. One of the US players had been a member of the Hollywood ‘Harmonicats,’ a harmonica band. On the trip, he brought with him 26 mouth organs to use entertaining the Japanese. Needless to say this slowed things down going through airport security. The highlight of the trip was the installation of a baseball themed ‘peace and friendship’ granite bench monument at Honkawa School with the names of team members inscribed upon it, both US and Japanese. Maynard considers having his name on the monument just as much an honor as being in the National Senior Softball Hall of Fame. a naval serviceman aboard the USS Duluth. Once a year, the Kids and Kubs play the St. Petersburg Mayor’s Team in what one member describes as a ‘blood game.’ The winner is inscribed on a perpetual trophy. Also at this game, donations are distributed by the club to charitable organizations. Since 1949, they have donated approximately $200,000 to charitable causes. At Thanksgiving and Christmas, club members serve dinners to needy seniors at the City Sunshine Center. The club now consists of four teams of 56 active players. Dues are $100 a year. Persons are eligible to join after their 74th birthday. Players sport white or red shirts, and white or blue pants, and a black bow tie worn on ceremonial occasions. The club is open to both men and women. While a few members have played serious baseball at the AA and AAA level, many have played little, perhaps some while in grade school or high school or on a church team. Accommodations are made for persons physically challenged. The current club president is Jon Wilkinson. He has been a member for eight years. Previously he played with Three Score, a club for persons in their 60s, and has extensive experience as a recreational team manager. He is retired from United Airlines. The Kids and Kubs are now considering new members for the fall season beginning November 1st. Also needed are volunteers for various tasks. Practice and games are on Tuesday and Thursday mornings, and some Saturdays. Call 727-893-7108 or email kidsandkubs@verizon.com. More information may be obtained on the website at kidsandkubs.webs.com. 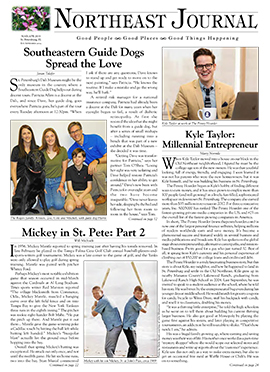 Sources: Raymond Arsenault, St. Petersburg and the Florida Dream: 1888-1950 (1988/96); George A. Bakewell, “The History of the Kids and Kubs ¾ Century Soft Ball Club” (1975); and conversations with Maynard Saugstad, Jon Wilkinson, Peter Calabrese, and Basil Whiteford.